Over the weekend, just in time for the start of Hanukkah, I posted parts one and two of the Twice Cooked Holiday Gift Guide. I prostrated myself most shamelessly before the greedy god of commerce, encouraging you to to click through this site to Amazon.com , and in the process support us, even as you shop for goodies for the gourmets and gourmands in your life. Today, I offer part Three — the do-gooder guide. This installment of our gift guide, you’ll notice, is a little bit different from the first two. I’m still beating the drum for you to spend, rather than make, to demonstrate your love this holiday season. But rather than spending at the online equivalent of a big-box outlet, on baubles or books that will end up in a drawer (or on a shelf) by March, I’m encouraging you to get some perspective, and give the gift of giving instead. 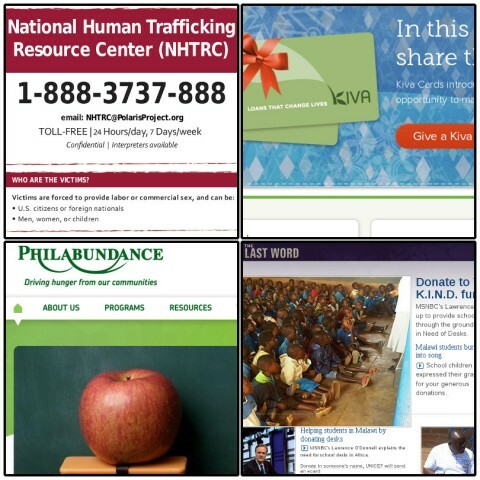 Listed here are four causes — five organizations — that do important work, that need your help, and that offer some compelling options for how to make a charitable donation a viable gift to someone in your life. Much as I have encouraged you all (dear readers!) to buy stuff as gifts, this is better. This is, for the most part, what I am doing this holiday season. And I know — know! — that in each of your lives, there are potential gift recipients who would appreciate this, as well. Much to my shame, I did not get around to posting these suggestions until a couple of days into Hanukkah. But just because it’s night number three doesn’t mean it’s too late. These organizations offer both hard-copy and email notifications to honorees. So if you donate today, there is no reason that your gift recipient won’t know it by candle time tonight. As for the rest of you — well — your holidays aren’t for two weeks, yet. Buy now! There’s still plenty of time. Kiva.org: I’ve talked about Kiva here before. What they do is act as a microfinance facilitator, matching lenders in the United States — folks like you and me — with budding enterprises in the developing world. You might lend twenty-five or fifty dollars, for example, to a woman in Ecuador who’s trying to start a bakery. She gets her business off the ground, pays back the loan through Kiva, and you get to loan the money again. It’s a way of stimulating local economies in places that desperately need it. And it’s a way of using that same small quantity of money, over and over, to do good in lots of places. Kiva offers a Kiva Card, which is like a gift card, delivered in hard copy or email, to get your gift recipient started on the road to international (micro)finance! The Polaris Project: The Polaris Project is an organization devoted to ending human trafficking — modern-day slavery — in the United States and around the world. They take a multifaceted approach to the problem, running a human trafficking hotline, offering training programs and assistance to law enforcement organizations, providing social services for victims, and advocating for changes in policy in the United States aimed at curbing the problem from the top down. They are well-organized, and endorsed by the admirable Nicholas Kristof of the New York Times. And it is a simple thing to give in honor of your friends and family by clicking here. Kids in Need of Desks: K.I.N.D. is a project endorsed by MSNBC’s Lawrence O’Donnell, and run by UNICEF, that is set up to equip classrooms in Malawi with desks. Your support goes to local carpenters in Malawi, who gain a steady income by making the desks. And the desks go to children who would otherwise have to sit for long hours on schoolhouse floors. The project is economic stimulus for a place that desperately needs it. And it facilitates learning for children who need that, too. And it is super easy to give by clicking here. Your Local Organization That Fights Food Insecurity: I don’t have just one of these to suggest, because which organization is right for you depends on where you live. In Philadelphia, we have Philabundance, which acts as a facilitator that connects farms, food manufacturers, and grocery stores with community kitchens, food pantries, and ultimately people in need. Not every organization will work exactly like this. But the problem of hunger is (increasingly) urgent across the United States, and almost anywhere you live, a quick Google search will reveal, at the very least, a kitchen or pantry in your area. Los Angeles has the very effective SOVA, for example. And other communities have them too. These organizations — or at least Philabundance and SOVA — offer easy ways to donate in honor of somebody else. And what better holiday gift can there be than ending another person’s hunger? Again: you can find the other two installments of the Twice Cooked Holiday Gift Guide here and here. But this third installment is really the best place to find gifts.